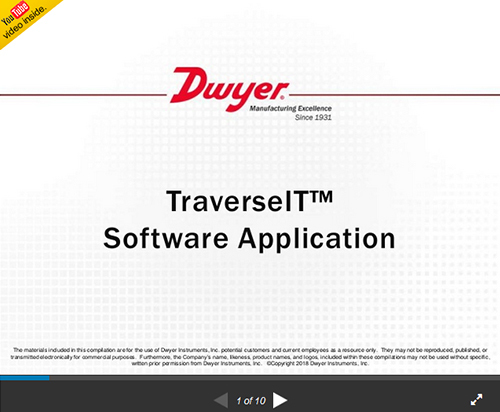 The TraverseIT™ Air Velocity Measuring Software Application displays air flow measurements from Dwyer’s Series WDPM Wireless Differential Pressure Module or Series AP2 Hot Wire Thermo-Anemometer Probe and guides balancers through the duct traverse process using step-by-step instructions. The traverse process is a method for calculating the maximum airflow in a duct. Several readings are taken across a traverse plane which are converted into velocity, and averaged. The TraverseIT™ app calculates air flow using ISO 3966 and 5801 standards, yielding highly accurate flow readings with each traverse. 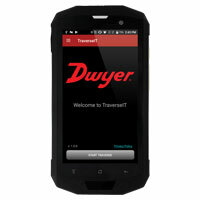 The application comes factory installed on a Dwyer rugged handheld unit that is included with a variety of balancing instruments or it can be downloaded directly from the Google Play™ store. *Latest updates to application can be downloaded using the Google Play™ store.